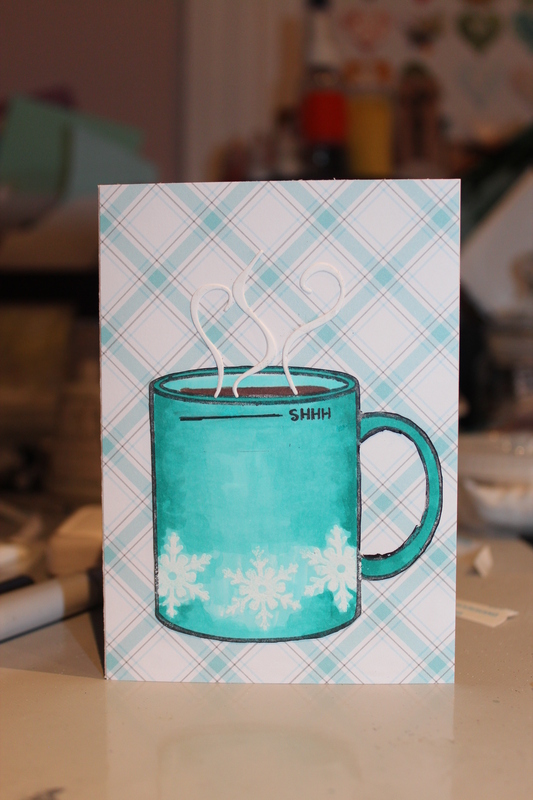 I made this card this morning for Papertrey Ink’s Make it Monday. The theme was to colour vellum. 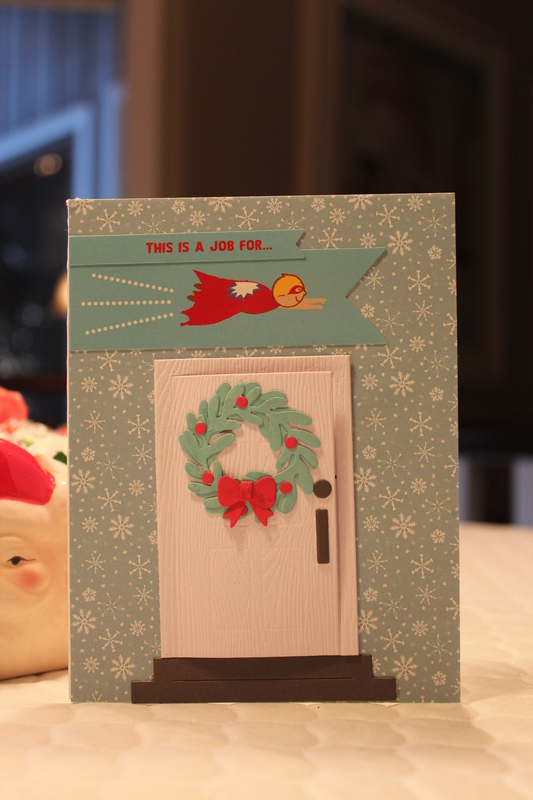 I actually really like the design of my card, but it is really only a first attempt. I have ideas in my head that would improve it greatly, but I have to go to work this morning so I have no time to start over. The next few days before Christmas are going to be a blur, so what is here will have to do. I can’t believe that it is the last day of the bloghop. I feel like I am just starting to get some ideas flowing. I still have a new coffee stamp set that I haven’t used. Maybe, I will get a second card done later today. Meanwhile, this one uses some different images from the Gina Marie Designs stamp sets that I got last week. 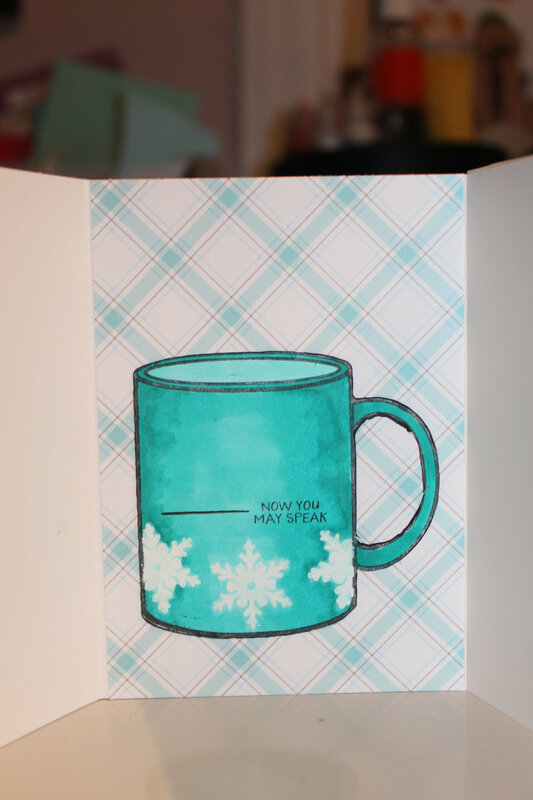 I used the tea cup this time and combined it with one of the “for all audiences” sentiments in the other stamp set. 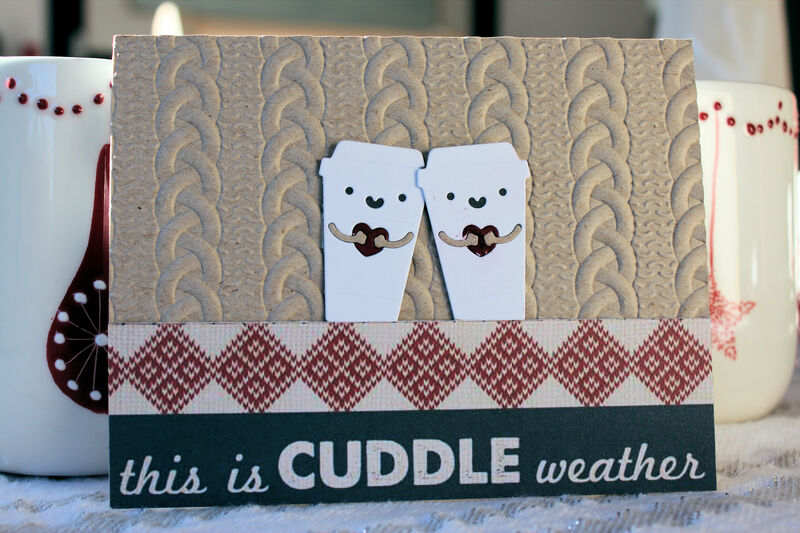 I just had to make one more card with the great 3 D Cable Knit embossing folder from Stampin Up. This time I decided to make two cups of coffee cuddle up on a brown cozy knit sweater background. 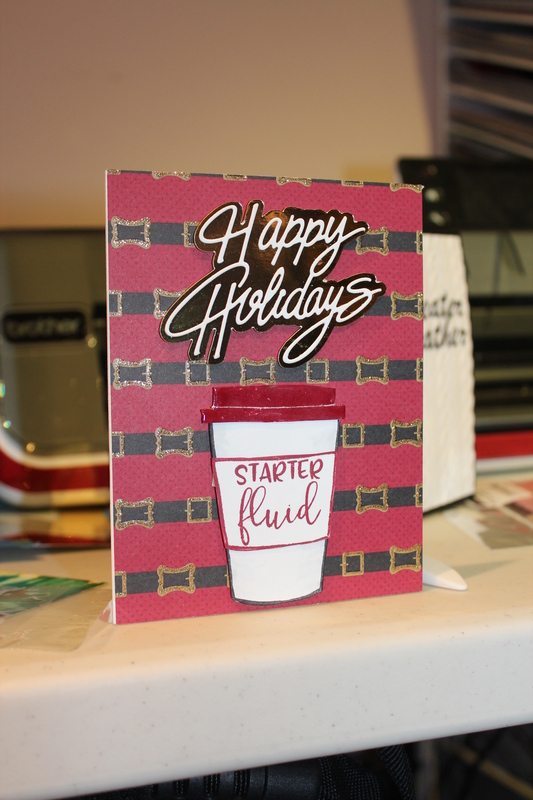 Today I used the 3D cable knit embossing folder from Stampin Up to make a card front. 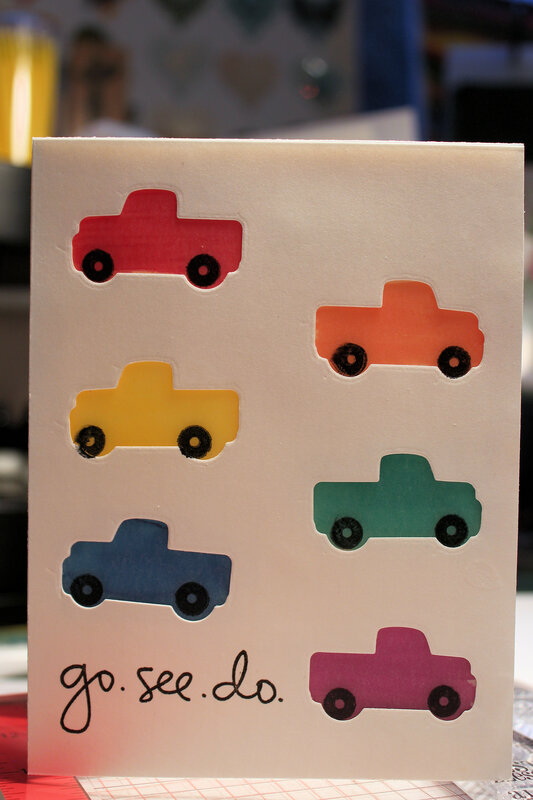 I absolutely love how deep and realistic looking the embossing is from this folder. 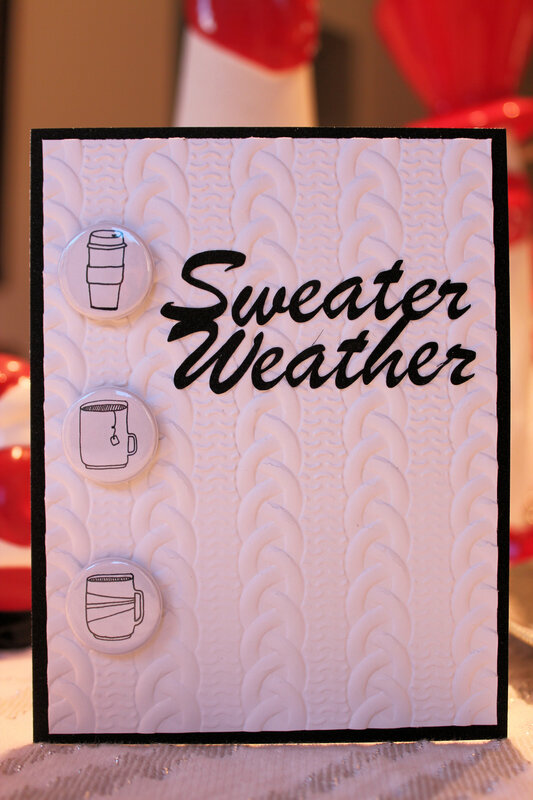 Once again it was too pretty to cover up and put in the background, so I decided to make it the focal point and just add some cute coffee “buttons” so that the whole card front looks like a cable knit sweater. Indeed I have a sweater with buttons that looks much like this (minus the sentiment, of course). I was not over my fascination with my new stamp sets from Gina Marie Designs. 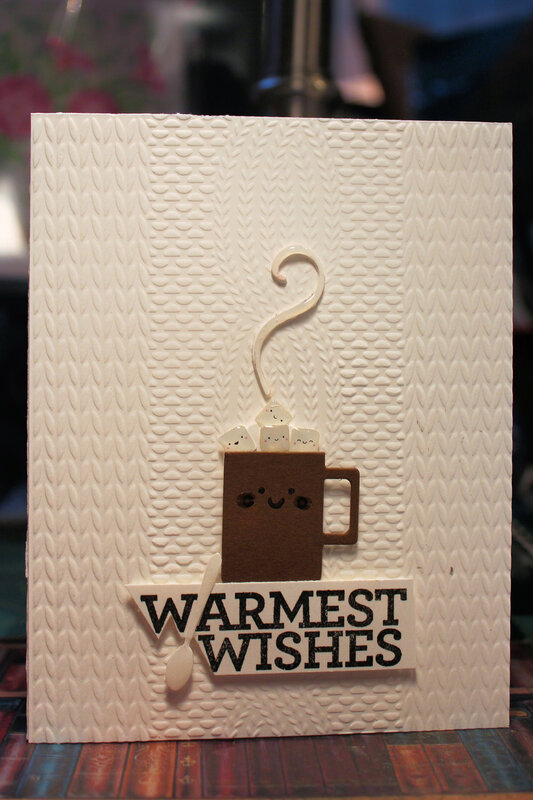 I thought that the sentiment I used in this card describes I how I feel about coffee in the morning. I was sitting at my computer today when an email came in, informing me that my stamp sets from Gina Marie Designs had been delivered. I laughed out loud because 1) I just ordered them last week (I am in Canada and delivery is routinely two weeks) and 2) it was Sunday. Imagine my surprise when I went to the mailbox and there was a shiny foil envelope from Gina Marie Designs. I have never received an emergency delivery of stamp sets ever before. It was really a pleasant surprise. Anyway, I immediately started thinking about how I could use them for the bloghop. It was Amy who posted about these amazing stamp sets and did warn me that they were somewhat snarky and off beat. Some of the sentiments are a bit out there, but I love them. I picked out the more moderate stamp set and made this gatefold card. 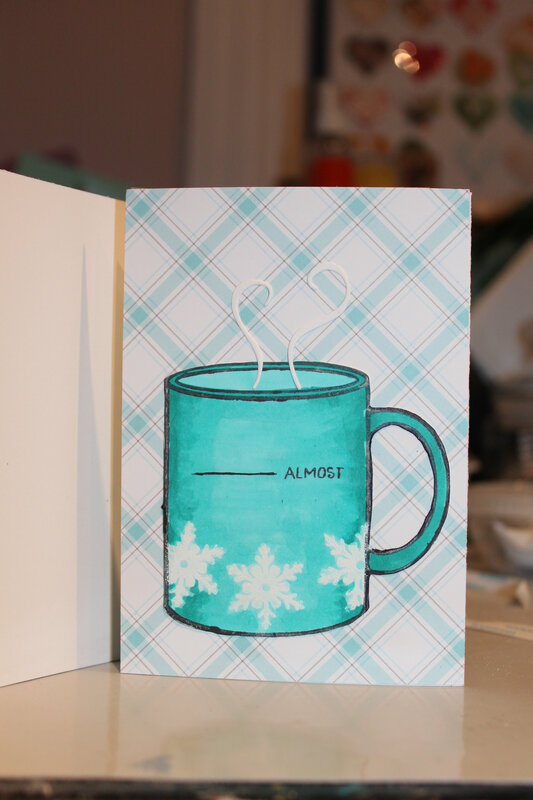 I was going to add my own sentiment to the front of the card that would have said, “Morning grounds rules” but it was too late at night to pull out the gazillion tiny pieces alphabet stamp set that I would have needed to do so. Today was one of those days where time was at a premium. Luckily, I saw a cable sweater embossing folder (Richard Garay) that I wanted to use. I wanted the centered cable pattern to be visible, so that dictated that the focal image be small. I decided to make a mug of hot chocolate with a die set from Stamplorations (giveaway prize in a previous bloghop) I wanted to dress it up just a little so I made the sugar cubes from Doodlebug’s Latte Love Sprinkles into marshmallows. I added Nuvo Glaze to the steam, teaspoon and cheeks on the cup. 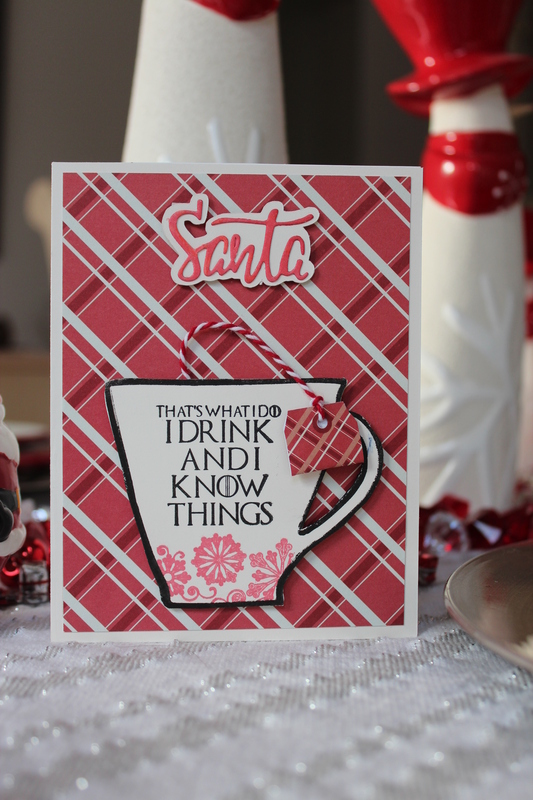 The sentiment is from Stampin Up Christmas Bliss stamp set. Wow, do the days fly by. I think I just managed to store my stash of coffee themed stamps and dies away last week and today I got them out for the Winter Coffee Lover’s Bloghop which starts today. I sat down and looked at my stash for a few minutes. Nothing was jumping out at me, Sometimes, when inspiration has gone AWOL, I will just pull out a new stamp set and stamp off a few images. That usually gets the ideas flowing This time I thought I would start with a background that I had made and never used. When I opened the container of backgrounds, sitting right on top was a shadow box using Lawn Fawn dies. The shadow box used the Winter plaid patterned paper pad and the back of the box had snowflakes on it. Ok I was getting somewhere. I had a winter theme going here. I then looked through my Lawn Fawn stamps and spied the Forest Feast stamp set. 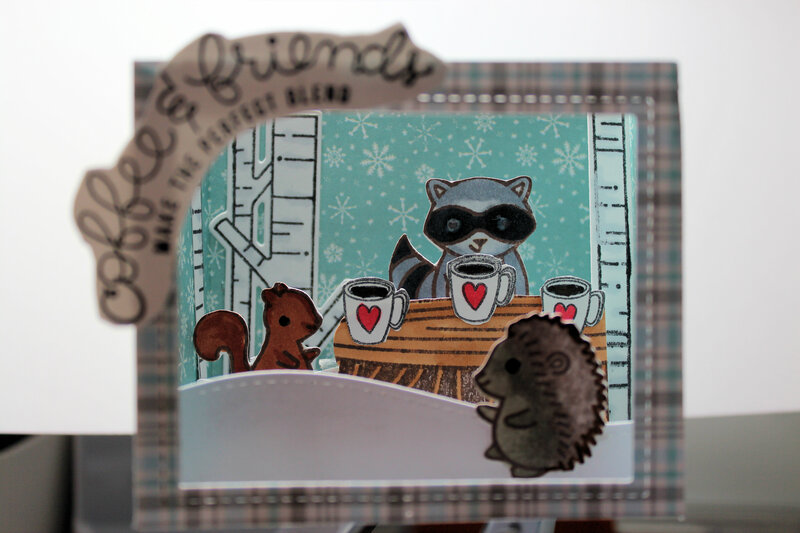 Why not make a scene of forest friends enjoying a morning coffee klatch? The shadow box turned out well. I added some birch trees from the Lawn Fawn Joy to the Woods stamp set and dies to add to the woodsy scene. 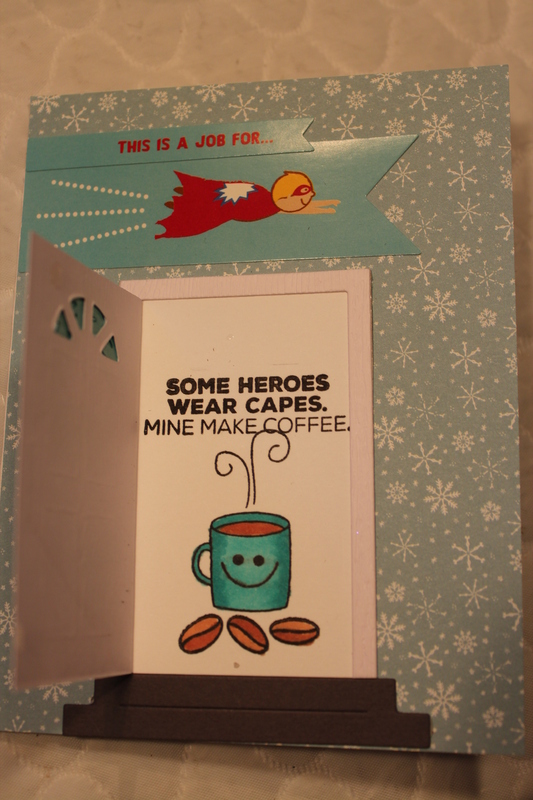 The sentiment is from Simon Says Stamp Coffee and Tea stamp set. The only problem came when trying to photograph the shadow box. I had to choose to either focus the back of the scene or the front of the scene and because it was dark outside, the flash cast horrible shadows as well. Bad photography to be sure, but a cute first project for the hop.